The Foodie Spot: Review - Crust Pizza Co.
Review - Crust Pizza Co.
A friend tipped us off about a new pizza place in The Woodlands, TX called Crust Pizza Co. Michelle and I stopped in for lunch last week to check it out. This place is simply delightful. 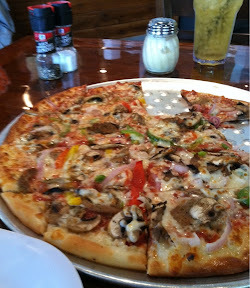 The pizza is great, the service is warm and friendly, and its a relaxing spot to visit. The decor is modern and inviting. We enjoyed it so much Michelle and I decided to go again this week. I've seen some great looking sandwich's and salads head out to the tables, but haven't tried any of those yet. With the care going into all Crust Pizza is doing, I am certain everything on their menu is worth a shot. There are just certain foods that require a weekly fix. Good cheese enchiladas(with onions!!! ), BBQ, a well made hamburger, and a great pizza are among the foods that I must crush on a regular basis to remain civil. Without them I am not such a joy to live with. Michelle would welcome the opportunity to explain this to you. A good pizza, in our area of town, is not found just anywhere. In hangover desperation mode I'll call in a Dominoes or a Pizza Zone dude to deliver a box of remedy. I'm talking about the kind of hangover where I answer the door in my double secret fat pants, 15 year old cotton T shirt, Jack Nicholson Ray Bans, and padded tube sockets that reach the bottom of my knees. A greasy pizza, Goode's headache powder in lieu of parmigiana, a 32oz Dr. Pepper, A Coen Brothers film marathon, and I'm good as new. Fortunately I rarely have to call in for the hangover pizza dude. For a pizza fix here lately, we've been reaching in our pocket for a visit to Grimaldi's. The famous New York standard with a location here in The Woodlands makes a heck of a Pizza. I feel bad for those folks with gluten issues, because Grimaldi's dough is a 100 year old recipe producing a glutenous heaven cooked in a coal fired brick oven. I'm pretty sure they use a high gluten flour to get that wonderful crispy yet chewy texture. Their pizza perfection also comes with a New York price tag, but it doesn't stop me from signing up for that experience. What I'm driving at is Crust Pizza, in my humble opinion, has managed to hit the flavor/service/value sweet spot. The pizza's Michelle and I have devoured were very tasty. Their crust is different and wonderfully good. Crust's dough has an appealing sort of buttery lightness to it that is very nice. The ingredients throughout are obviously higher quality than you will find at any of the big chains, and yet your wallet isn't lifted like a unfortunate visit in New York. When waking into Crust Pizza you find a cozy looking place. They've got the brick wall going, the big wine rack, the warehouse lamps, the flat panel TV, and the chalk board of specials. It's an open kitchen concept where you can watch all the magic happen. That is when I noticed one of those automated pizza conveyor ovens, and I honestly thought "this ain't gonna be good". No coal fired brick oven? No black pans and oven oozing layers of seasoning? The pizza snob in me bubbled right to the surface like a smoked mozzarella on well cooked pizza pie. The atmosphere at Crust Pizza, the friendly staff, and the big screen TV tuned into ESPN opened me up to an honest try. Consider me an automated pizza conveyor oven convert thanks to Crust Pizza Co. They either understand how to slow that rack down, or have a crust recipe dialed in for that gizmo oven. Unlike the undercooked doughy pizza loafs the delivery dudes bring that we usually finish baking in our own oven, Crust Pizza shovels out a perfectly thin & crispy gem. A great pizza at a very fair price. 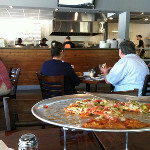 The best pizza in The Woodlands - Grimaldi, Crust Pizza? Oh, I don't know, but it is clear they both stand out way ahead of the rest. Grimaldi the 100 year old New York pizza legend, or the local entrepreneur with the guts to believe. The extra edge of having the business owner take your order in a warm inviting way weighs heavy in my pick. We chatted with owner Clint for a bit on our last visit. He's bringing perhaps the most important ingredient to a pizza place...passion! It's clear Clint is in love with what he's doing. His staff has taken his lead too. These guys are hustling for your happiness. It's nice to watch a local guy jump in the game, fill a niche, and put forth the effort to make you notice. Well done guys and gals. Suggest you stop in soon. You'll probably be in line behind Michelle and I.